I love this film. 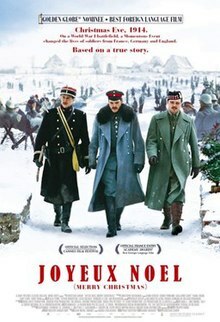 It has been criticized for a sentimental bent and for not being as biting as Kubrick’s Paths of Glory, but the film still has a punch to it, before and after the quiet dignity of a moment of peace celebrated in the middle of a war. There really was a Christmas Truce in 1914, and I see it as one of the most glorious moments of history, no matter how brief it may have been. The film looks at the consequences of the truce, and that’s the part that speaks volumes in its subtlety. Basically, after the truce happened, the generals in charge realized that fighting would not happen, which would spoil their lovely little mindless war. There was absolutely no point to World War One, remember that. It was not a war to save anyone from anything. It was the ludicrous conclusion of jingoistic nineteenth-century nationalistic bombast. It was Europe attempting to commit suicide. It was a war that should have been cancelled. There was no justification for it at all, and there the soldiers were at the end of 1914, cancelling it. And that made the generals furious. Soldiers were transferred to different fronts, units were disbanded, and officers were disciplined. In the film, all that is shown. It’s easy to shrug that off and say, “Oh well, no good deed goes unpunished. So what else is new?” The repercussions, however, are juxtaposed with the reverence and quiet joy of a mass celebrated in no-man’s land. That makes a key difference. If peace on earth and good will to men are the words of Jesus – and truly, they’re also the words of Moses, Buddha, Zoroaster, Mohammed, and Lao Tzu – then what of the notion of “kill them all, every one?” Even if one rejects the notion of the existence of a Satan, the notion itself is a Satanic one. The governments and their state religions, educators, and civil servants in uniforms present an enemy to peace and good will. The men in those places hold power, and they use the threat of violence to compel otherwise good people to do things that maintain that power while exploiting or harming other people. This is something that was not unique to the world of the Great War. It is something that is a standard condition here on earth. In essence, government is naturally the enemy of peace. In a blissful anarchy, it is the man who grabs a weapon to enforce his will that shatters the tranquility with the ugliness of despotism. Therefore, it is the duty of the righteous to provide an alternative to despotism in which justice and peace can prevail as much as possible for the people so governed. Sadly, what men can no longer seize from without they corrupt from within and what men created to ensure liberty and order becomes the very thing that destroys both. This message is conveyed quite clearly in the film. Looking at the world of today, it is quite evident that no politician in the USA, not even my locally-elected representative, is truly working for the people. Each is beholden to interests that form a plutocratic oligarchy that I have no access to. To preserve the special privileges for those at the top, we here down below are made to suffer. It matters not who is in Congress or the Presidency or the Supreme Court: only those who will betray the poor in a Satanic bargain with the rich will be permitted to rule. The film shows that they will continue to do so, but hints to us all through the scenes of peace that there is a higher power and we are all accountable to it. While those that promote the ideals of peace and good will are the dread enemies of the worldly power brokers, it is still worth promoting the ideals of peace and good will. One will never see massive wealth or great power through a policy of peace and good will, but why would one want that massive wealth or great power if it meant harming one’s fellow man? It is the Satanic bargain of murdering – even if only a little, through a lie or a cheat – to get gain versus the Godlike covenant of doing unto others as you would have them do unto you in order to have peace. This entry was posted in Reason to Live on 12/19/2011 by deanwebb.